If you’re stressed out and could you a very special kind of tension release, relief is right at your fingertips with Pink Dill Dough™ Stress Reliever Putty! We’ve created a uniquely dill-lightful formula that is designed to start out stiff and ease into a soft and satisfying dough as you work it with your hands. If you need to relax, put everything you’ve got into a long, hard dill-dough sesh. This glow-in-the-dark, pink stress reliever will soothe your soul and bring a smile of genuine contentment to your lips. Strictly for use with your hands, no-nos are a no-no!! 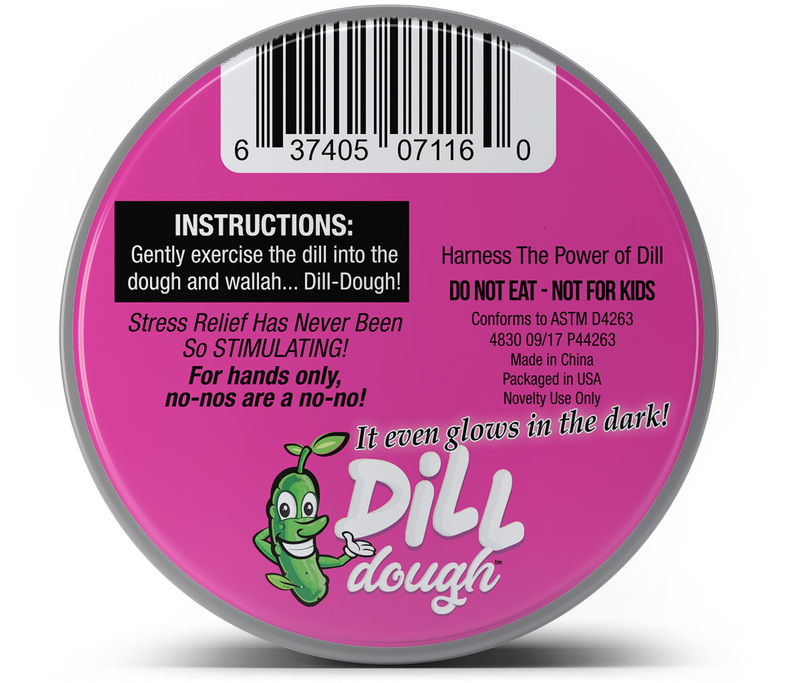 Pink Dill Dough Stress Putty glows in the dark for your added pleasure! Prefer to work your stress out with the lights off? Flip that switch and get your illuminated squeeze on, sassy pants! The more light you feed your pink putty, the longer and brighter it glows! Pro Tip: For the best glow, leave your Dill Dough in direct, bright light. Like and truly special toy for ladies, it totally digs the extra attention, and the pay-off is ohhhhh so worth it! Funny pickle gifts are fabulous for any occasion or no particular occasion at all. After all, a Pink Dill Dough comes in handy all year long! This weird gag gift for adults makes a slightly naughty and absolutely outrageous addition to wild bachelorette gift baskets and happy divorce presents, as well as care packages, birthday presents, stocking stuffers, and just to say, “Seriously, girl, I think you could really use a sassy, pink Dill-Dough in your life.” Looking for a wacky Secret Santa gift or White Elephant idea? A cute tin of pink, glow in the dark dill dough is a surefire showstopper! NOTE: Pink Dill-Dough is strictly for your hands! No-nos are a no-no, or you’ll really be in a pickle!